APT is offering a companion-fly-free deal (just pay taxes from $795) when booking an APT Africa holiday next year before December 31, 2012. The deal represents savings of up to $2040 per couple. The deal applies to all 16 itineraries running through the May-to-September season. The 29-day South Africa Highlights, for example, includes 15 nights in South Africa, two at Victoria Falls and 11 nights in Kenya-Tanzania (featuring three nights in the Serengeti and Masai Mara national parks, views of Mt Kilimanjaro at Amboseli and private game lodges in Kruger and Thanda Game Reserve in South Africa). It is priced from $18,595 per person, twin share, based on the May 19 departure which includes all flights in Africa and two charter flights in East Africa, coach and 4WD game viewing, accommodation (private game lodges, luxury camps, hotels), 62 meals, local guided excursions and game drives, tipping and APT Tour Director. Contact: 1300 229 804, www.aptouring.com.au, or see local travel agent. 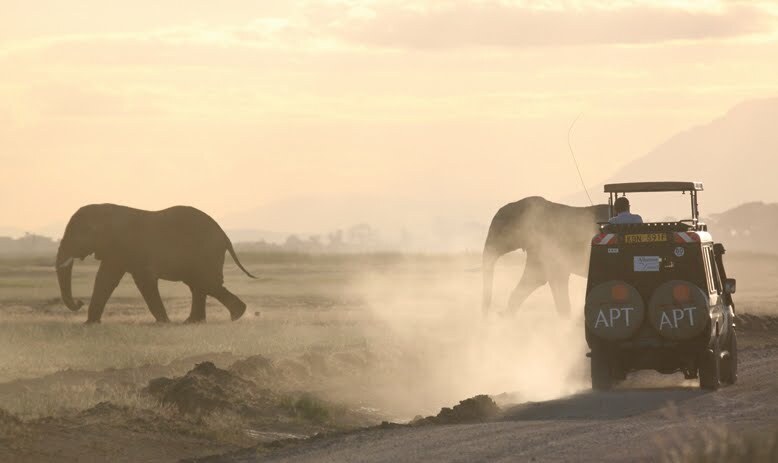 APT has built on its successful Africa debut this year with new lodges, hotels, a new private game reserve, an extra night in Serengeti National Park and a second itinerary with a three-day Zambezi Queen luxury cruise safari on Botswana's Chobe River. APT's 68-page 2013 brochure for Africa (South Africa, Kenya, Tanzania) offers the choice of 16 itineraries including Cape Town to Cairo with Nile cruising in Egypt, and one garden-themed tour operated by sister company Botanica. They range from 14 to 34 days through the May-September season. Luxury Rovos Rail features in many itineraries while all tours offering four-day Rovos Rail extensions from Pretoria Cape Town. Writing the forward in the brochure, APT owner Geoff McGeary describes the program as "an incredible combination of luxury and adventure" ... which "can't be matched." "From our close-up wildlife encounters to unbelievably intimate outdoor dinners, private 4WD game drives with just two or three other couples, expert local game trackers and drivers, to hotels and resorts and luxury lodges and camps set in the heart of iconic game reserves ... we've taken the best elements of independent African travel and enhanced them," Mr McGeary wrote. Tour group size limited to 28 guests, fully-inclusive packaging featuring all flights within Africa and Egypt and opportunities to see the Big Five are other key selling features of the APT Africa adventure. The company's popular Freedom of Choice Sightseeing Inclusions has been applied to six locations. For example, at Victoria Falls (a 7 Wonders of the World site), options are helicopter ride or elephant back safari. Among the list of APT's exclusive Signature experiences -- apart from viewing the wildlife -- are, game viewing while cruising on the 14-suite Zambezi Queen, viewing Mt Kilimanjaro at sunset during sundowner drinks, a private tour of Kenya's Olduvai Gorge, outdoor Boma fireside dining at Thanda Tented Safari Camp, traditional Zulu lunch and dance performance, lunch made from home-grown produce at Tanzania's River House Shanga, a private concert by The Kenyan Boys Choir in Nairobi and African drumming and regional Cape Malay cuisine. The "Exclusive" tag is applied to accommodation too. It includes Tinga Private Game Lodge in Kruger , Thanda Tented Safari Camp in Zululand's Thanda Private Game Reserve (new), Karen Blixen Camp in the Masai Mara, Soroi Serengeti Lodge in Serengeti National Park (three nights instead of two), Madikwe Safari Lodge in Madikwe Game Reserve, Lions Sands in Sabi Sands Private Game Reserve, Escarpment Luxury Lodge overlooking Lake Manyara (new), Fairmont Zimbali Resort, the Royal Livingstone Hotel, De Opstal Country Lodge, Table Bay Hotel on Cape Town waterfront, Turbine Hotel and Spa in Knysna (new) and the Boardwalk Hotel and Spa in Port Elizabeth (new).